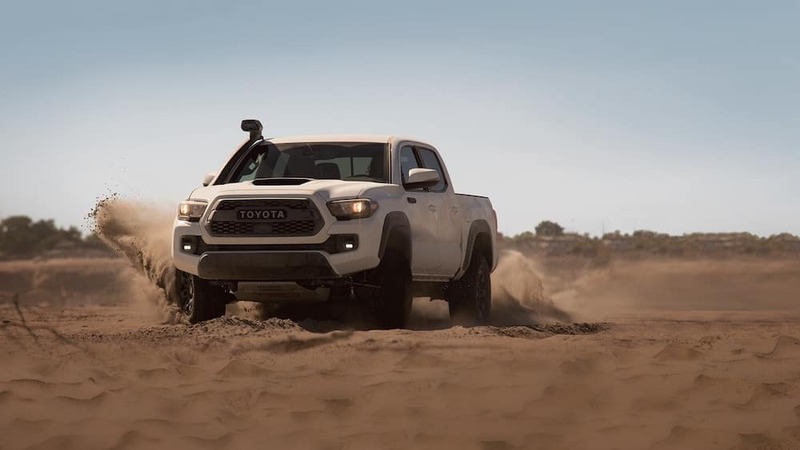 The engineers on the Toyota Racing Development team have released a new version of the Toyota Tacoma TRD Pro, and in 2019, this off-road-ready Toyota truck is capable of more than ever before. Whether you look to the impressive Tacoma TRD Pro engine specs or this pickup’s exceptional array of unique features, you’re sure to be pleased with what it’s bringing to the backroads near Bluffton and Hilton Head. The Toyota Tacoma TRD Pro price starts at $42,810 MSRP. This is the best-equipped TRD model in the 2019 Toyota Tacoma lineup, and accordingly, it’s priced above the Tacoma TRD Off-Road and Tacoma TRD Sport. Drivers who opt for the 2019 Toyota Tacoma TRD Pro will be able to select from two configurations. These are a 4×4 V6 with a manual transmission–the standard option–and a 4×4 V6 with a 6-speed Electronically-Controlled Automatic Transmission with intelligence (ECT-i). The Tacoma TRD Pro wheelbase is equal to 127.4 inches, and its front and rear track widths are both 64 inches. You’ll enjoy an impressive 9.4 inches of ground clearance, thanks in part to this model’s TRD-tuned off-road suspension and 2.5-inch FOX® Internal Bypass shocks. All models come standard with 4WDemand part-time 4WD with an Automatic Limited Slip Differential. TRD-Tuned FOX® Internal Bypass Shocks – These massive FOX® shocks are designed to deliver a smoother, more controlled ride, and they’ve been engineered to handle the most inhospitable terrain. Tacoma TRD Pro Grille – An unmistakable heritage-inspired grille feels equal parts aggressive and refined. This reference to the past shows that Toyota has the experience and the know-how to show the way forward, and it’s not hard to look at, either! Tacoma TRD Pro Cat-Back Exhaust – This stainless steel, chrome-plated, and TRD-embossed exhaust pipe delivers a raw and satisfying roar when you press down on the gas pedal. Tacoma TRD Pro Desert Air Intake – A standard air intake, positioned high above the windshield, allows the Toyota Tacoma TRD Pro to power through the toughest conditions. Your engine will never lack for clean air. 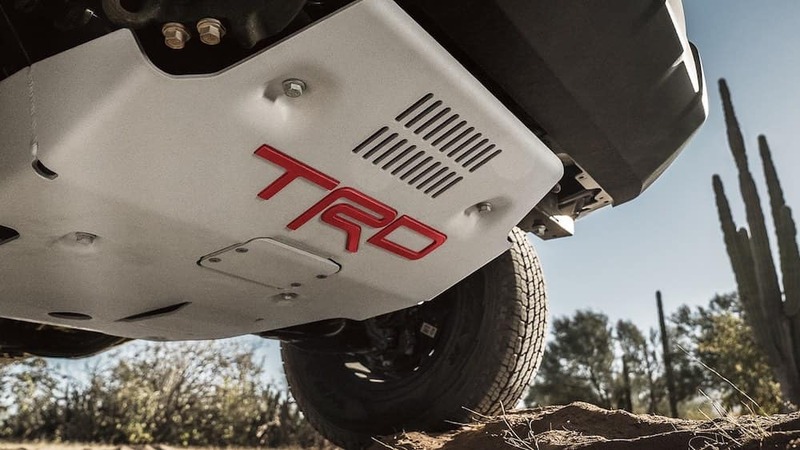 Tacoma TRD Pro Skid Plate – A full quarter-inch of aluminum separates your pickup’s vulnerable underbelly from the rocks and debris you’ll encounter far from the beaten path. Inside the cabin, you’ll encounter TRD Pro floor mats and headrests alongside a premium JBL® Audio system and a 4.2-inch color multi-information display. Toyota Safety Sense™ P is standard. 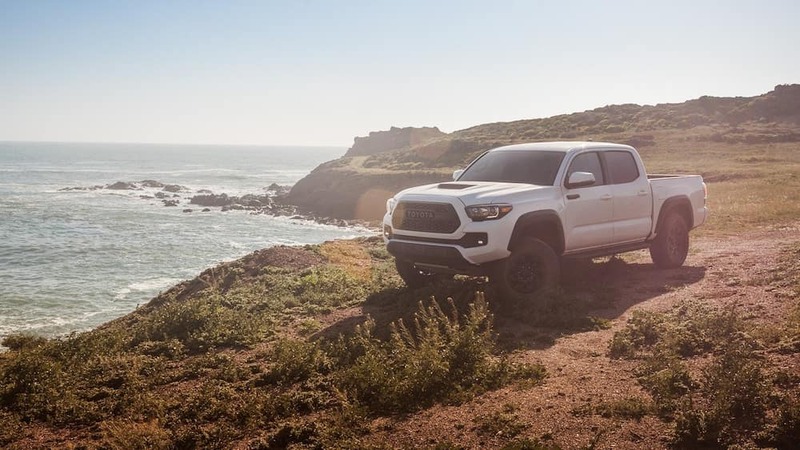 The 2019 Toyota Tacoma has more than enough power to go head-to-head with the 2019 Ford Ranger, and once you’ve seen what the TRD Pro can do, you won’t be able to settle for any other truck. Explore our new Tacoma inventory to find a Tacoma TRD Pro for sale in Savannah today, and then reach out to schedule your test drive.